Today was a rest day. Which in Nepal meant walking down steep stone steps for an hour to a town lower in the valley, changing into swim trunks, and then walking another 30 minutes down more steep steps to the river. Kalu was left behind as this was a "downhill" day. If I decided to try my luck at ABC I had to return to Chhomrong anyway. My foot felt strangely improved. It still hurt, my tendon still felt like a refried sausage, but somehow, inexplicably, all those hours of walking downhill seemed to be helping it. One of the achilles rehab exercises is performed by standing on a step, raising your heels, and then very slowly lowering them. Somehow it strengthens without hurting the tendon. I could only guess that I was avoiding stress by riding Kalu uphill, and then maybe I was doing something like the rehab exercise by walking down. But the result was bizarre by any standards--the idiotic idea of tramping up and down the cliffs of the Nepal foothills might possibly be helping my recovery. Eventually the trail slope lessened, and the roar of a large river increased. Finally we rounded a bend and there it was. Below me was the Modi Khola, a torrent of grey glacial melt, thrashing and tumbling down the valley's knife-edged bottom. 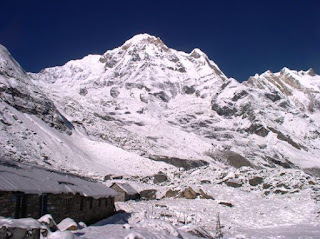 The Modi Khola was the reason that you could penetrate the core of the Annapurna massif. The mountain glaciers birthed rivers on all sides, but in the Annapurna sanctuary this runoff combined into a steep bowl, which poured out of a fissure on the south side. The ABC trail followed the Modi Khola back up to its source. The Annapurana Sanctuary is a remarkable place. At ABC itself, you are literally surrounded by 7000 and 8000m peaks on all sides. Sunlight takes a long time to enter, and in the winter it stays dark all day. Massive landslides and avalanches tumble routinely down onto the path, destroying it and anyone unlucky enough to be caught in its path. In 2001, 3 Australians and an Israeli were killed in an avalanche that tumbled off of Hiun Chuli into the Modi River. And just a year later, 3 German tourists and a Nepalese guide were swept away and crushed in 2002, at the same spot! On top of this, during big rains/snows (like the ones that are occuring now every afternoon), floods will wash away the feeble stone bridges over the Modi, which must be crossed several times. Your reward for making it? ABC is fairly high at 4130m (13,600'). But to the West, towering over you at almost twice the height, 2.5 miles above, is Annapurna I (8091m / 26,700') the king of the realm. To the South is Annapurna South (7219m / 23,800') and Hiun Chuli, to the North Khangsar Kang (7485m / 24,700'), the Northeast Ganggapurna (7454m / 24,600') and Annapurna III (7555m / 24,700'), and to the Southeast Machhapuchhre (6997m / 23,100'). The darkess, danger, and reward make it irresistable for the trekker. But I didn't have to make that decision until the evening. Ahead of me, next to the raging river, were 3 steaming hot pools of lovely leg therapy. For once it was sunny all morning, and it was a very pleasant change to spend the day lounging in the natural pools, reading Paulo C.'s Like the Flowing River, and occasionally taking a brain-freezing dip in the icy water a few rocks over. Now, after a nice long nap, its decision time. And I still have no idea which way I am headed tomorrow. Back down to sanity and my safe hotel? Or onward to destiny (and a possible helicopter evac)?